After the Civil War there was an acute shortage of beef in the northern states. Texas ranchers were burdened with five million head of cattle and no railroads on which to ship them to market. Realizing the immense profit to be made, Texas cattlemen looked for the nearest rail heads. Thus began the era of the long cattle drive and Kansas cowtowns. From 1866 to 1885 hundreds of thousands of Texas longhorns were driven annually to shipping points in Kansas. Abilene, Ellsworth, Wichita, Dodge City, and Caldwell received the major portion of the booming cattle trade. Baxter Springs, Newton, Hunnewell, Great Bend, Hays, and Junction City achieved periods of brief success. The Chisholm Trail served as the major trail to many of the Kansas cowtowns. After years of use, it was described as being 200 to 400 yards wide and as bare as a city street. As quarantine laws and homesteaders' fences closed off more and more towns to Texas drovers, Dodge City emerged as the principal Kansas cowtown. From 1875 to 1885 Texas cattle followed the cutoff on the Chisholm Trail or the Western Trail to the "Cowboy Capital." Texas cattle drives actually began before the Civil War but on a small scale and ceased during the war. The 1866 season brought large herds and the cowboy crowd to Baxter Springs in the southeastern corner of the state. Profits were low that year and fewer herds were driven north the following year. In 1867 Joseph G. McCoy, a young cattle dealer from Illinois, decided Abilene would make a good rail head. When McCoy arrived in Abilene in the spring of 1867, the town consisted of only a few log cabins. McCoy built the Drovers Cottage and Great Western stockyards and promoted the rail head to Texas cattlemen and by September 1867 when the herds started to arrive, he was ready for business. Abilene received about 35,000 head of cattle that first year. The arrival of the Union Pacific, Eastern Division Railroad, known as the Kansas Pacific in 1869, connected Abilene to the east. Under McCoy's leadership, Abilene reigned as the primary market for Texas cattle for four years. Although many people profited from the cattle business, not all Kansans approved of it. The longhorns carried a tick that spread Texas fever among local cattle. Farmers lobbied the Kansas legislature to enact quarantine laws to keep the Texas cattle out of their area. By choosing Abilene, McCoy had actually violated the 1867 quarantine law which only permitted Texas cattle in the area south and west of present McPherson. The town was so sparsely populated, however, and the potential profits so great that no one objected. By 1870, Abilene had grown to the point that a marshal was needed to keep order. Thomas J. Smith, an experienced lawman, was known for using his fists rather than his gun to end disputes. He lost his life to an assailant's bullet and then was nearly decapitated. "Wild Bill" Hickok was hired as Abilene's town marshal in 1871. He had a reputation for being a quick draw and for spending most of his time playing cards in the saloon. Although dressed in buckskins for this photograph, he often wore the finer clothes of a dandy. In 1871, the last big year for Abilene, more than 40,000 head of cattle were shipped out by rail. 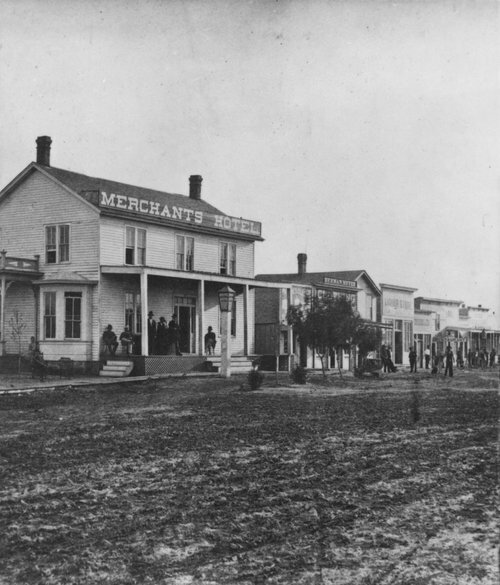 Increased settlement and community disapproval of the cowtown lifestyle forced the cattle market to move west to Newton and Ellsworth. In 1871, Newton experienced its only major cattle season. It was described that year as probably the roughest town in the West with 27 saloons, eight gambling halls, and a boot hill. The businessmen of Ellsworth anticipated the shift in the cattle trade from Abilene to their town. In 1872, the Drovers Cottage, once owned by Joseph McCoy, was moved to Ellsworth. It could accommodate 175 guests and the stable held 50 carriages and 100 horses. Ellsworth would dominate the market from 1871 - 1875, while receiving stiff competition from Wichita. Ellsworth quickly attracted those businesses associated with the cattle trade such as drover's stores and boot shops. John Mueller did a brisk business with his "Big Boot" company. In the first months of the 1874 cattle season, he reported sales of more than 100 pairs of boots to the cattlemen. Most drovers arrived in town in June and completed shipping by early fall. In the 1873 season, more than 150,000 cattle were trailed to Ellsworth. Over 30,000 were shipped out by rail while most of the others were sold to stock western ranges. As the era of the cattle drives passed, Ellsworth, like other cowtowns, became a solid business and farming community. In 1872, the Wichita and South Western Rail Road line reached Wichita. It provided the necessary link with the Santa Fe Railroad trunk line, which would carry cattle to eastern markets. The following year 66,000 head of cattle were shipped out of Wichita, twice as many as from Ellsworth. Every cowtown had its rough part of town and Wichita was no exception. The "Delano" district was the hub of gambling and drinking activities in Wichita. Among its cast of characters was dance hall proprietor "Rowdy Joe" Lowe who shot and killed his business rival, "Red Beard." Every cowtown also acquired a police force. Some lawmen served several different towns during their careers. Wyatt Earp served on the Wichita police force in 1875 and 1876 before moving on to Dodge City. An experienced "gun toter," Earp ironically almost ended his own life in a freak shooting accident. On Sunday, January 9, 1876, while sitting in the back room of the Custom House saloon, his gun slipped from his holster. He had committed the serious error of leaving the hammer resting on a loaded chamber. When the gun struck his chair, it discharged sending a .45 caliber slug through his coat. Contemporary accounts noted that the gunshot "got up a lively stampede from the room." Brothers Mike and John Meagher served on the Wichita police force in the 1870s. Mike's service as marshal involved everything from rounding up hogs (done more in the early years before the cattle boom) to disarming rowdies and arresting robbers, horse thieves, and murderers. Although not working as a law officer at the time of his death, in 1881 Mike was shot down while assisting the Caldwell city marshal with an arrest. Junction City, located on the Kansas Pacific Railroad line, was a secondary shipping point for the cattle trade. Hays, like Junction City and Great Bend, was never a major cattle market. It did receive some business, however, because of its location on the Kansas Pacific Railroad line and the ready market at Fort Hays. The combination of railroad workers, freighters, buffalo hunters, and soldiers, plus occasional cowboys, made it a very rough town for a number of years. Dodge City’s mostly male population found needed supplies such as: whiskey, guns and ammunition, clothing and billiards at local stores. Founded in 1872 shortly before the Santa Fe Railroad line reached Ford County, Dodge City served primarily as a civilian community to nearby Fort Dodge. Business also centered on the sale of buffalo hides and bones before the cattle trade era began in 1875. When quarantine laws closed Wichita to the cattle trade, Dodge City emerged as the "Queen of the Cowtowns." From 1875 - 1885, more than 75,000 head of cattle were shipped annually. Many thousands more were driven through Dodge to stock northern ranges or to be shipped from other railheads. Firearms were prohibited in Dodge City, however, in 1875, it is estimated that as many as 25 people died of gunshot wounds. Down the street from the Dodge House stood John Mueller's new boot shop. When the cattle business failed in Ellsworth, Mueller promptly followed it to Dodge City. He finally sold his business in 1880 to devote his full attention to raising livestock. Dance halls and saloons were a fixture of all Kansas cattle towns and Dodge City had some of the finest. Sometimes the saloon owner sponsored the gaming. Individual gamblers also worked the taverns looking for an opportunity to ply their trade. Favorite card games were poker, monte, and faro. Dice games and keno, a game similar to bingo, were also popular gambling activities. Prostitution has traditionally appeared where there is a high percentage of men and a low percentage of women. This was the case in the cattle towns of Kansas. Brothels were established but many women worked for the dance halls where they earned money from dancing, as well as prostitution. Dodge City boasted of three dance halls for a brief time but for most of its ten years as a cattle town, there were only two. The city also earned an income from these activities by levying taxes on liquor, gambling, and prostitution. Dodge City had the most impressive list of gunmen and lawmen of any town in the West. Wyatt Earp, the Masterson brothers, Bill Tilghman, Clay Allison, Luke Short, Dave Mather, and "Doc" Holliday all resided in Dodge at some time in their careers. These noted gunfighters convened in Dodge City to assist their friend, Luke Short, in an episode that became known as the “Dodge City War.” Co-owner of the Long Branch Saloon, Short had violated a new city policy banning prostitutes from saloons. Short and his partner, prominent banker and cattleman, William Harris, felt that the law had been unequally enforced since mayor and rival A. B. Webster had not faced similar prosecution. Short was arrested, then forced to leave town. He appealed justifiably to the governor that he had been denied due process. A compromise was attempted but Short chose instead to convene his pals to ensure his permanent return. The state's adjutant general was finally able to mediate a settlement before any violence erupted with Short being permitted to stay in town. In the early 1880s, the existence of gambling, drinking, prostitution, and dance halls in town, often in open violation of the law, began to heat up as an issue. The "Dodge City War" in the spring of 1883 was followed by pressure from the Santa Fe Railroad to clean up "their" town. The reform-minded and status quo factions were still feuding when David Mather came to town the following year. A gambler who went by the nickname "Mysterious Dave," he served as assistant marshal in 1883 and 1884 and was co-owner of the Opera House Saloon on Front Street. Because of its prominent downtown location, the city council objected to his decision to turn it into a dance hall. They passed an ordinance banning all dance houses but took no action against the one owned by Mather's successor as assistant city marshal, Thomas Nixon, allegedly because of its remote location. For several months, Nixon and Mather battled to put each other out of business. The feud escalated when Nixon fired some shots at Mather. Three days later, Mather ended the rivalry by shooting and killing his competitor. Pat Sughrue worked as a blacksmith in Dodge when not serving as a peace officer. Elected sheriff of Ford County in 1884, he was in office during the final days of the cattle era. An epidemic of splenic fever among the Texas longhorns sent local cattle growers and eastern buyers into a panic. Under orders from the governor, Sughrue had the unsavory task of turning back trail-hardened drovers from the Kansas border. This situation coupled with low beef prices and decreasing availability of empty rangeland, led to the passing of the cattle drive era after 1885. Mike Sughrue served as deputy sheriff of Ford County under his twin brother Pat. For his heroic efforts in capturing a murderer, the citizens of Ashland, Clark County, elected him their town marshal in 1885. Caldwell challenged Dodge City for the cattle market in the 1880s. Although it was within the quarantined area, it was so near the border that it was able to conduct business without any problems. Known as "the Border Queen," nearly 100,000 head of Texas longhorns were shipped out on the Santa Fe line in 1882 and 1883. The rowdy behavior witnessed in other cattle towns was characteristic of life in Caldwell during its cowtown period, 1880 - 1885. On April 30, 1884, the citizens of Caldwell were shocked to learn that their marshal and his assistant were bank robbers and murderers. Early that morning, Brown, Wheeler, and two cowboys rode to Medicine Lodge to rob the bank. While attempting to defend his property, the bank president was fatally wounded by Brown. Wheeler immediately killed the cashier. Realizing their plans had failed, the four robbers fled. Within hours, this posse captured the four bank robbers in a canyon outside of town. The citizens of Medicine Lodge were ready for a lynching but the sheriff managed to secure his prisoners in the town's jail. 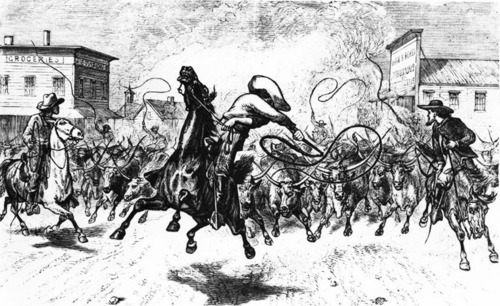 During the evening of April 30, 1884, a mob overpowered the sheriff. The prisoners attempted to escape when the doors to the jail were opened. Shots were fired and Brown lay dead. The three remaining prisoners were taken to an elm tree east of town and hanged. In the 1880s, Hunnewell flourished briefly as a shipping point for Texas cattle. Located on the Kansas-Oklahoma border in Sumner County, the Leavenworth, Lawrence and Galveston Railroad provided quick access to the Kansas City stockyards. Typical of cowtowns, the business district of Hunnewell reportedly consisted of one hotel, two stores, one barbershop, a couple of dance halls, and eight or nine saloons. Violence of all kinds was not uncommon to Hunnewell. As one railroad worker recollected years later, "There was no Bat Masterson to control the casual use of firearms, and there was more shooting than I ever saw in Dodge City." By the mid-1880s, many events came together to end the cattle drive era in Kansas. Rail lines had reached directly into Texas, there was a growing demand for better bred stock, quarantine laws were continually closing off more and more of the open range and what was left was being filled up by homesteaders. Although the trail drives were over by 1885, the cattle business in Kansas did not end. By 1890, the state ranked third in the nation in cattle production.